Character LCD modules are one of the most popular LCD technologies thanks to their ease of programming, low cost, low power consumption, and short lead times. They can be seen in a wide variety of products. Most character LCDs are driven by an eight-bit parallel interface which makes use of the standard HD44780 protocol. The display has sixteen pins/connections to drive both the LCD and the optional LED backlight. Note: Some displays without a backlight only have 14 pins and The order of the pinout may be different for each LCD manufacture. Here is the pin configuration for a standard 16x2 with a description for each function. Click here for a full data sheet. Most LCDs contain a controller/driver chip whose whole job is to convert software/commands from the microprocessor to the LCD. They make the job of programming much easier since the chip contains a built-in character table. The table assigns a number between 0 and 255 for every possible letter, number, and punctuation mark. The programmer simply sends a number, such as 2C, to the chip and the letter ‘M’ appears. A character LCD contains several 5x8 pixel character blocks. Each block has five (5) dots across and eight (8) dots up and down. These dots are turned on and off to generate all possible characters. 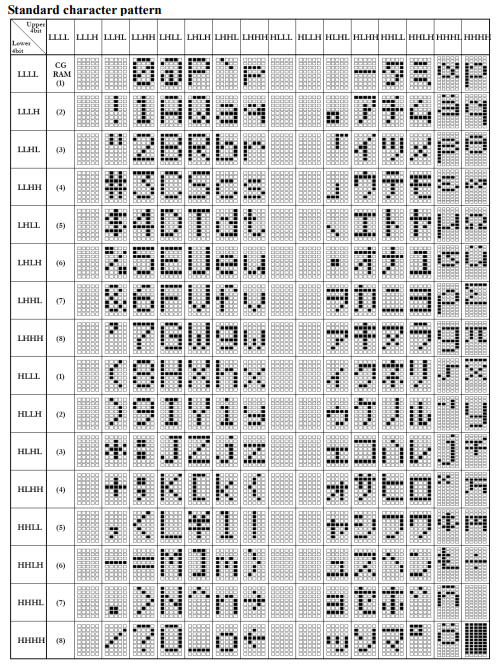 The character table built into the controller/driver chip saves the step of having to address each dot to create the letter or number desired. The most common character configuration is a 16x2 which means there are sixteen 5x8 character pixels across and two rows, for a total of 32 characters.